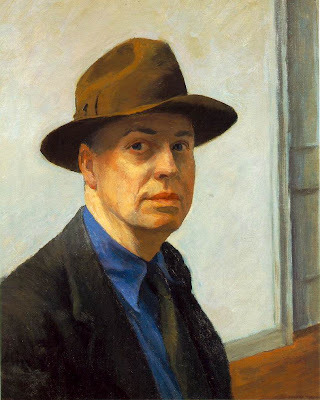 Self-Portrait, Edward Hopper, 1925-30 Oil on canvas 25 1/16 x 20 3/8 in. A couple of years ago I painted a fellow at a local “landmark” restaurant here in Spartanburg, SC called the Skillet. I called it Morning News. When I paint or draw something there is always a combination of emotional interest and design interest that captures my eye and inspires me. In this case there was this wonderful landmark of a restaurant (I read in a newspaper when I first moved back home that the building/shopping strip the Skillet was located in would eventually be torn down and redesigned and rebuilt.) and the great design of the figure against the background and counter. To make a long story longer…. when a friend saw the painting in my studio she remarked that it reminded her of Edward Hopper. That comment piqued my interest so I (alway the student!) did some research on Hopper. In 2005 I had the opportunity to visit Hopper’s childhood home in Nyack, NY when I was attending at week workshop with Burt Silverman in Upstate, NY, so I of course knew of Hopper. As I researched him more I did feel a connection with some of his subject matter – the world that he lived in – the hotels, motels, trains, highways, restaurants, theaters, cinemas and offices around him. 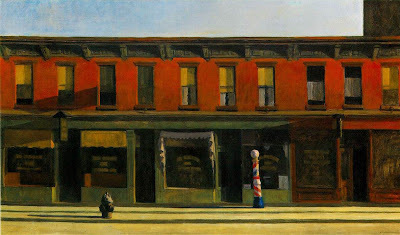 Early Sunday Morning, Edward Hopper, 1930 Oil on canvas 35 x 60 in. 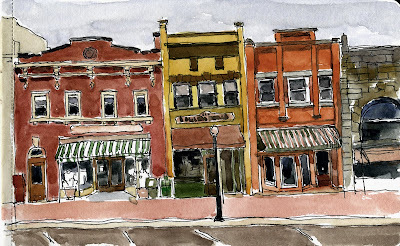 I decided to paint a group of building in Spartanburg’s downtown area (one of which was my Step-father’s Drug Store which was the first painting I painted upon returning home, Heinitsh Walker.) which are inspired from Hopper’s “Early Sunday Morning” I’ve created sketch in my Moleskin Sketchbook with waterproof uniball, then I colored it with watercolor. On the easel is a 15″h x 30″ painting which I’m trying to photograph the process. Hope to complete the oil painting by next week and post the process. So on the the easel…. happy drawing, and painting. Be inspired and learn from the Masters. 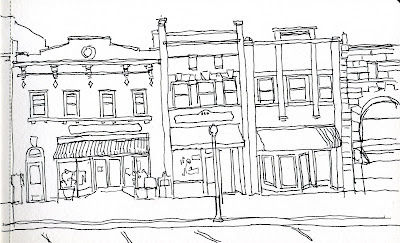 This entry was posted in Burt Silverman, City Scenes, downtown Spartanburg, drawing, Edward Hopper, Moleskine notebooks, Nyack NY Whitney Museum, uniball pen, urban scenes, Watercolor on October 23, 2009 by Isabel.